With the advent of agile methodology for the project delivery, a scenario where the code changes from multiple developers need to be built and tested on the build server presents itself very frequently even for multiple times even in a single day. And testing the build includes a lot of manual work right from building the code to verifying the deployment of the code on the build server. Continuous Integration and Deployment provide a way of coping up with this demand of the testing and deployment of the code to the environments like Preproduction, Quality Assurance servers and even to the production environment. 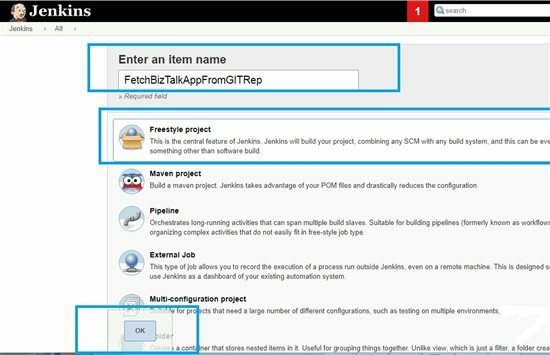 Continuous integration and deployment focus on automating following steps using various CI CD tools like Visual Studio Team Services (VSTS), Jenkins etc. Push the MSI to the next target Server. Steps 1 to 6 are done on the build server with a run restriction based upon the success of the predecessor steps. Once the Steps 1 through 6 are executed successfully, the installer package can be released to the immediate higher environment where the CI/CD tool deploys the installer package and then hands over the control for actual testing to the Testing Teams. The successful testing then can prompt the movement of the package to the next higher environment and so on till the code actually reaches the production environment. BizTalk Deployment Framework - Used to create the mMSIinstaller package for the BizTalk application. Jenkins- Used as the CI CD server. To automate the building and testing of the BizTalk applications. Following flowchart describes the flow for the build server pipeline tasks related to the CICD. The application used in this demonstration is a simple application which takes the first name and the last name of the person and returns the full name by appending the first and the last name. The BizTalk application is invoked through a WCF service. Following are the input and the output schemas used in the app. The BizTalk application project also has a unit test helper and unit tests project which contains the unit tests to test the map which is used to transform the input to output. The Unit Test projects take the help of the BizUnit framework and the Visual Studio Testing framework to run the unit tests. Following piece of code shows the implementation of the classes from the BizUnit framework and how they can be used to create the method to test the Maps in the sample BizTalk application. Following class shows how the unit test cases written to test the maps. 44. Value = "Mandar Dharmadhikari"
These unit tests can be run from the Visual Studio just like other unit test cases. The BizTalk Sample application also contains the deployment verification tests that use the NUnit framework for the testing. Following code shows the method which calls the BizTalk exposed WCF service and passes the first and last name and checks if the response returned is as expected. Following is the code used for writing the NUnit test cases. These Nunit Test cases can be bundled in the BTDF deployment for the application. There are some important settings that need to be done in the BTDF .btdfproj file to allow the auto-termination of the instances, deploying the IIS application, creating the IIS app pools and the IIS reset. The btdf project file for this sample application is as below. The Deployment Framework automatically packages most files into the server install MSI. copy them to the folder $(RedistDir) in the CustomRedist target. To include individual files, add an ItemGroup with AdditionalFiles elements. Bach File To Build The BizTalk Code: In order to build the Visual Studio code, the devenv.exe command can be run in the silent mode and the build log can be sent to a log file. In case if there are any build errors in the solution, the batch file will cause generate a fail message which will cause the who;e flow to halt. Following is the sample batch file. It can be configured to point to the location where the code fetched from the GIT is kept. Batch File To Execute the Unit Test Cases: In order to run the Unit Test cases, the VSTests.Console.exe command line exe needs to be run by providing parameters like the assembly containing the unit tests and the test settings file. Again it is possible to generate the log file for the run unit test cases. ( See References for more Details). "<VS Installation Path>\Common7\IDE\CommonExtensions\Microsoft\TestWindow\vstest.console.exe" "<Path To the assembly(dll) containing the Unit Test Cases" /Setting:"Path To the Test Settings File"
Power Shell Script to Modify the BTDF Proj file: One important point that needs to be taken care of while generating the BizTalk application MSI using BTDF is that the product version and the product id values need to be updated so that the upgraded version of the MSI is created. This facilitates the installation of MSI as an upgraded version the MSI will ensure that the older version gets uninstalled first and the newer version is installed later. If the version of the MSI is not upgraded then the administrator has to manually first uninstall the MSI from the control panel and then reinstall the new MSI. Following PowerShell script modifies the product version by changing the product id and the product version values in the BTDF proj file. This power shell accepts the path to the BTDF proj file as input and saves the modified btdf proj file at the same location. PowerShell Script To Install the Newly Generated MSI file and Export the Environment Settings File: This PowerShell script is designed to install the MSI generated by the BTDF at a particular location. Once the installation extracts the contents, the next step is to prep the settings file for the deployment of the BizTalk application on the server. This PowerShell Script accepts the location path where the MSI is stored and the path at which it needs to be installed. [string]$InstallArgument= "/i `"" + $MsiPath + "`""
[string]$InstalDirArgument = "INSTALLDIR=`"" + $InstallPath +"`""
$SettingsFileExtractPath = $InstallPath + "\Deployment\EnvironmentSettings"
$FilePath = "`"" + $InstallPath + "\Deployment\Framework\DeployTools\EnvironmentSettingsExporter.exe" + "`""
$ArgumentList = "`"" + $SettingsFilePath + "`" `"" + $SettingsFileExtractPath + "`""
Batch File To Run NUnit Tests: The Batch file uses the NUnit Console exe to run the NUnit Tests silently in the background. Nunit Console application can be downloaded from the Nuget Packages using Visual Studio. Following is the batch file. Batch File To Copy MSI to Shared Folder: The last task of the Build is to copy the MSI generated by BTDF to a shared folder if the build is successful end to end. This shared folder can be accessed from the next environment. 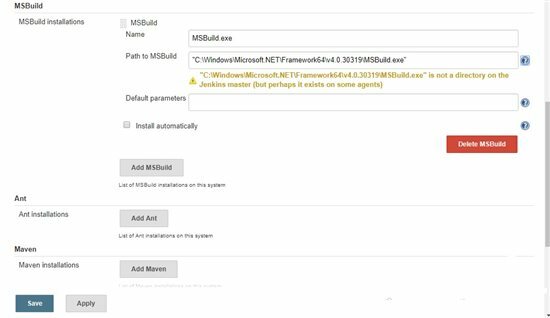 copy "Path Where Build MSi is Stored" "Path to the shared folder accessible from Next Environment"
Jenkins is installed as a windows service and is available on http://localhost:8080 . In order to make Jenkins able to do the deployments to the BizTalk environment, it is imperative that the Jenkins Windows service is configured to run using a logon of the user which has the administrative privileges on the Server as well as BizTalk databases. Following screenshots show the service configuration and the sample home page of the Jenkins. Once Jenkins is installed, following is the list of the plugins that need to be installed on the Jenkins Server. Refer to following set of screenshots to navigate to the page from which the plugins can be installed. Once the Plugins listed above are downloaded, installed and the Jenkins service is restarted, next task is to configure the plugins like MSBuild and GIT. Refer following to set up the plugins. Refer following screenshots to configure the MSBuild plugin. 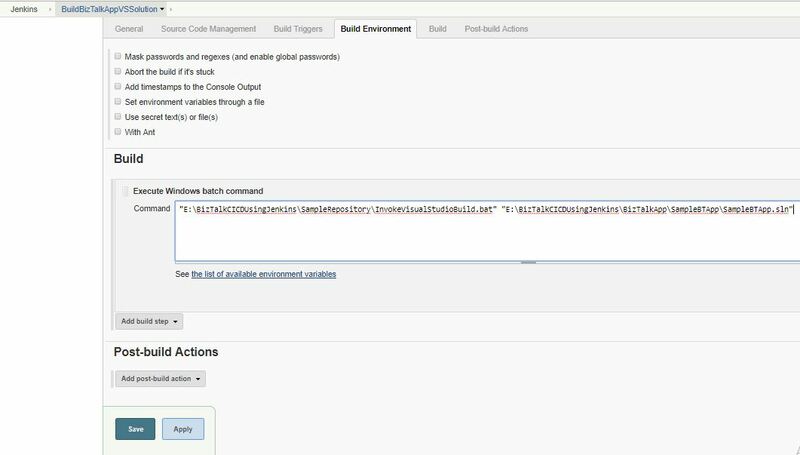 In order to connect to the Git repository, it is necessary to save the user access token for the logged in user in Jenkins. Refer to the following screenshot. 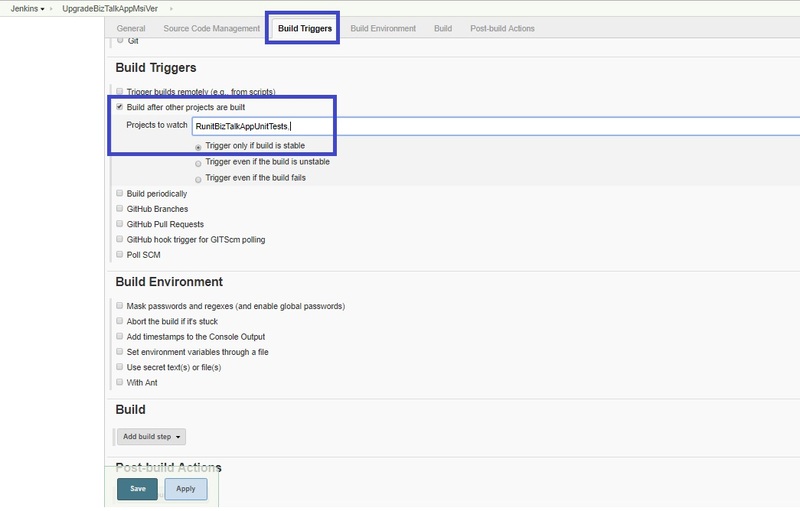 Following screen shot shows how to configure the GIT servers. 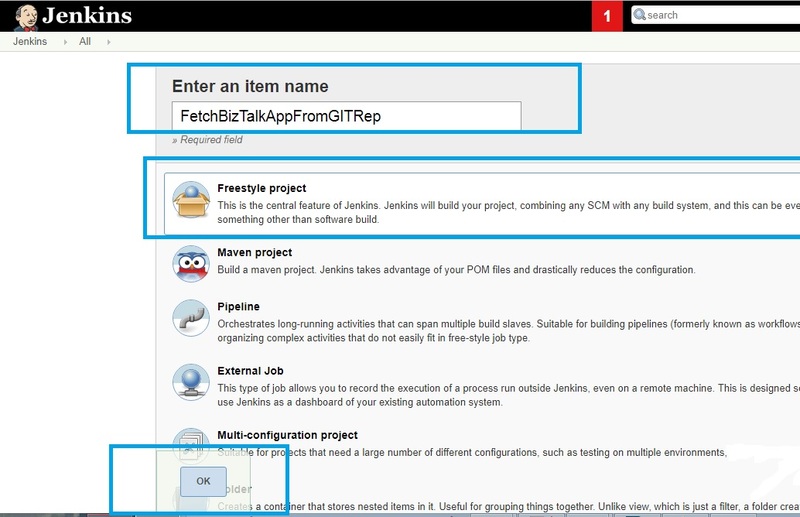 Once the GIT command line tools are installed on the Jenkins server, the path to git.exe is configured by default. This completes the basic configuration set up for the Jenkins Server. 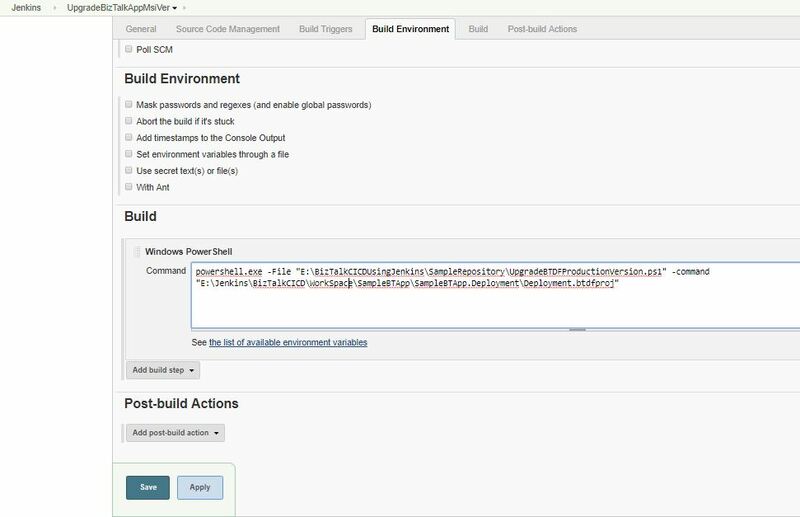 Once the basic configuration steps are done, Next step comes to the creation and configuration of the build jobs for each of the steps mentioned in the Introduction. Following screenshot shows how to add a new build job to the Jenkins. 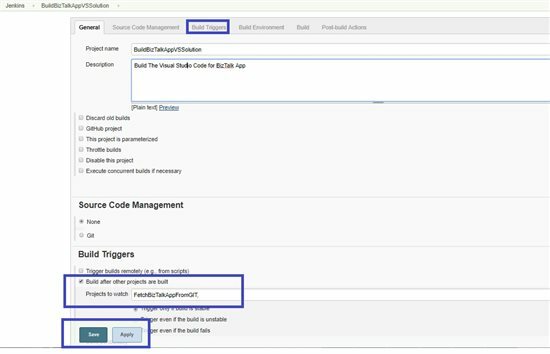 Following screenshots give a step by step approach to create the build project the fetch the code from the GIT Repository. This Build project is scheduled to run after every 15 mins but this can be configured as required. 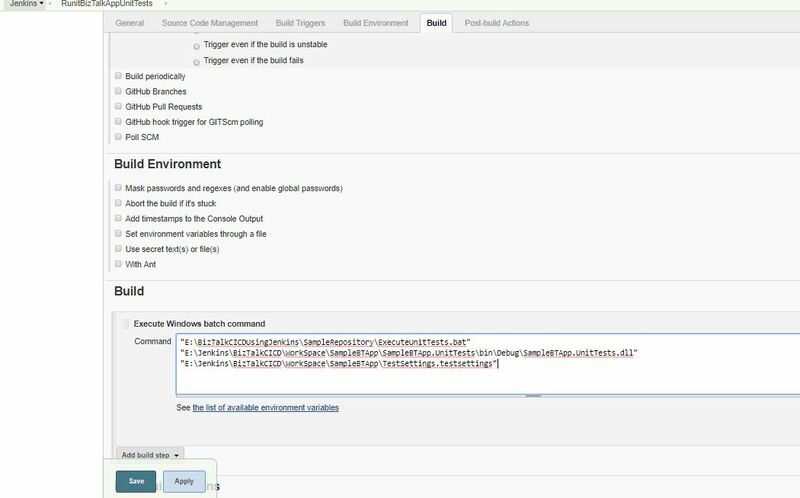 This Build job is created with a link to the previous job with a condition that a successful fetching from the Git Repository will fire the Build BizTalk Application build job. Paths indicated in above are as a sample. They should be changed as required. Once the job is saved, it is ready to run. Following Screen Shots give a sample way of configuring the Unit Test Case project. The paths shown are for sample purposes. Actual paths should be configured as required. The unit tests results can be published using the MSTest plugin that was downloaded earlier. 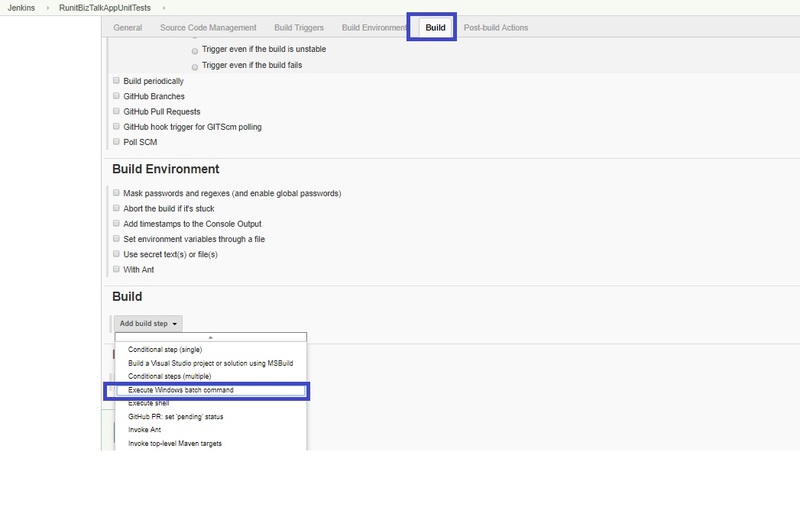 This can be done by adding a post-build action as shown below. As discussed earlier, it is imperative that the version of the BizTalk MSI should be upgraded to enable a smooth installation of the MSI on the target server. Following screenshots show the steps to invoke the PowerShell script to modify the BTDF project File. Once the Version of the Product is upgraded in the btdf project file, the next step is to create a BTDF powered MSI for the BizTalk application. 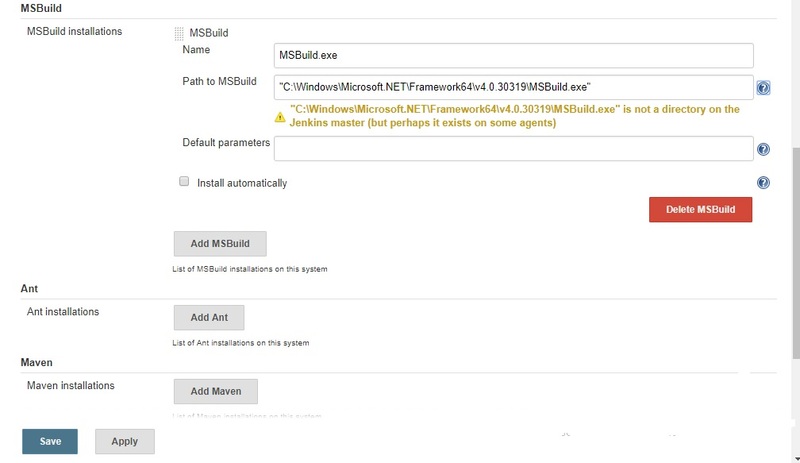 The MSBuild plugin of Jenkins is used to create the MSI. Prerequisite: Before the Build Project can be executed, it is necessary to add the InstallPath string value in the windows registry. Refer following screenshot for example. Following screenshots give a step by step process to set up the Build project in Jenkins. Once the BTDF powered MSI is created for the BizTalk application, next step is to install the MSI at a particular path and then to extract out the settings file for the environment. All this is accomplished using the PowerShell Script for MSI installation mentioned in the Scripts and PowerShell section. 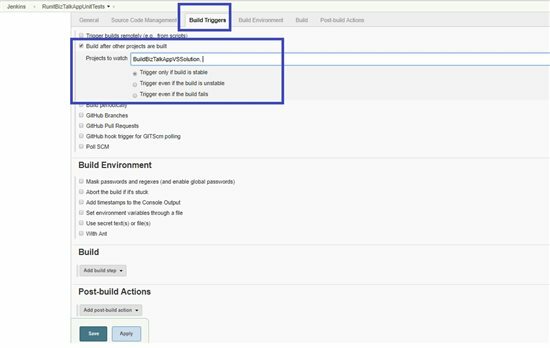 Refer the following screenshot to set up the Jenkins Build Project. Command Invoked in the screenshot is as below. Once the Msi is installed and the settings file extracted, the next task is to deploy the Application to the build server. 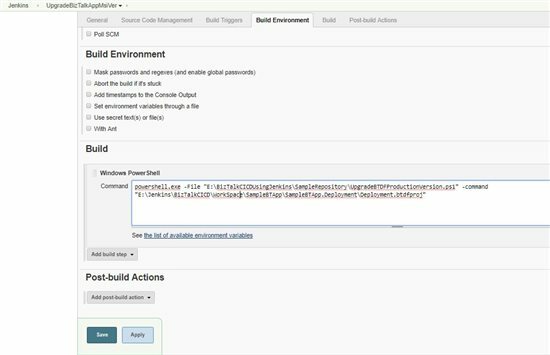 Here MSBuild.exe is used through the MSBuild plugin. Following Screenshots show the process to set up the Build Job for the Deployment of BizTalk application. Once the deployment is done, the next task is to check if the deployment is successful and to that, in this particular example the response from BizTalk exposed WCGF service is examined. To perform the actual testing, NUnit framework is used. The NUnit test cases are run using the NUnitConsole.exe from a batch file. BTDF enables the developers to deploy the NUnit Test Assemblies by configuring them in the btdf project. 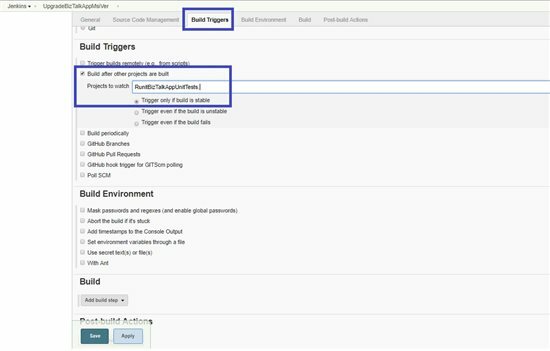 Following screenshots show a sample set up Jenkins Build Job for the Nunit Test Cases. Once the tests are run the reports for the test can be published using the NUnit Plugin which was downloaded earlier. Post build action needs to be set in the NUnit project. Providing the name of the Test results XML that was generated while running the NUnit tests. Refer sample screenshots below. The jobs that are created in above steps are chained together in such a way that the current job is triggered by its immediate upstream while the current job on successful completion triggers its immediate downstream job. This can be viewed together using the build pipeline view. A sample run of the whole BizTalk CI CD process is shown below. The scripts used in this demonstration can be downloaded from Technet Gallery from following link. 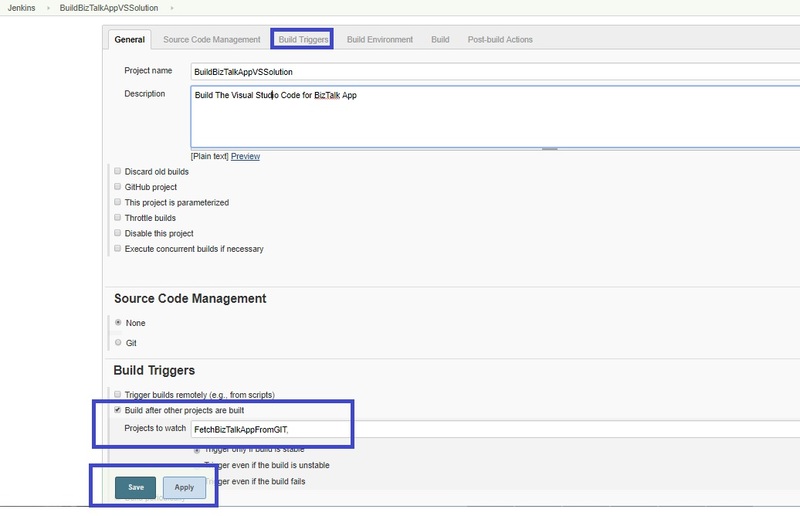 Based upon the results obtained in the build pipeline view, it can be concluded that Continuous Integration and Deployment for BizTalk application can be set up with ease using Visual Studio, BTDF, BizUnit , NUnit, Windows PowerShell and Jenkins build server. Following are some of the links that can be used for extra reading.